Let me just show a few samples. 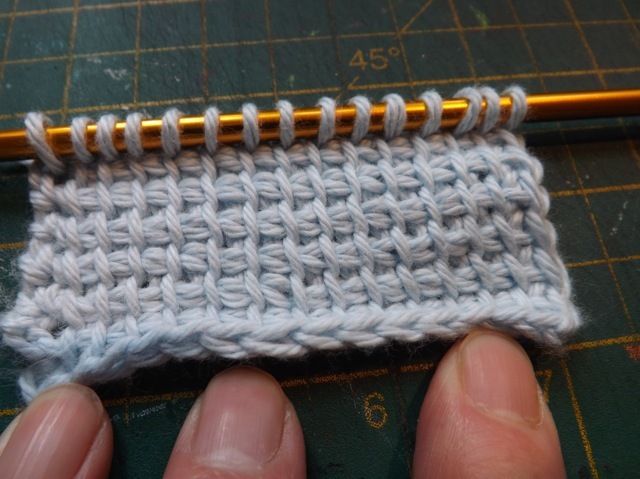 This is the standard Tunisian Simple Stitch – please try to ignore my crappy left edge. I just cannot seem to get the hook in the right place to make it looks just right. It’s my next thing to tackle. 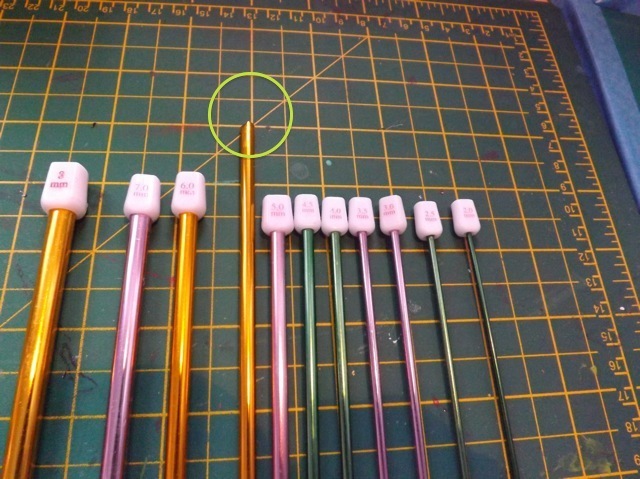 Anyway, you can see the bottom edge, and the side of the base chain, inserting the hook into the middle of the chain. 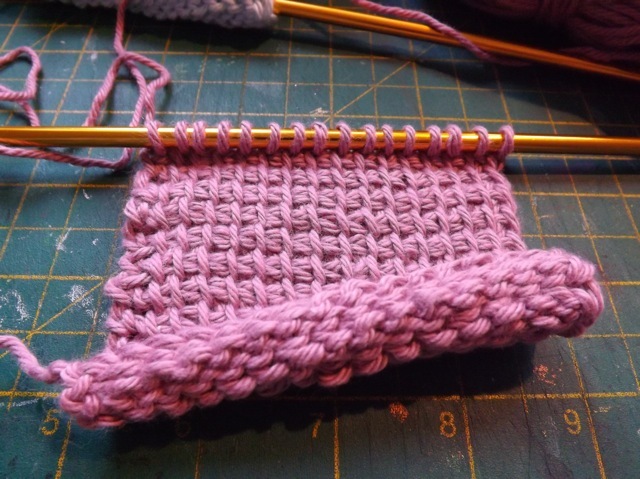 I really like the edge, with the knit-like stitch on show. While this is mean to decrease the roll, when I let go…. OK now this is the technique I discovered – first look at the three samples, all done with different colours of the same yarn brand (also probably 20 years old, and a cotton) all on the same hook. I’ve lifted the hook up (Look Ma! no finger death grip!) 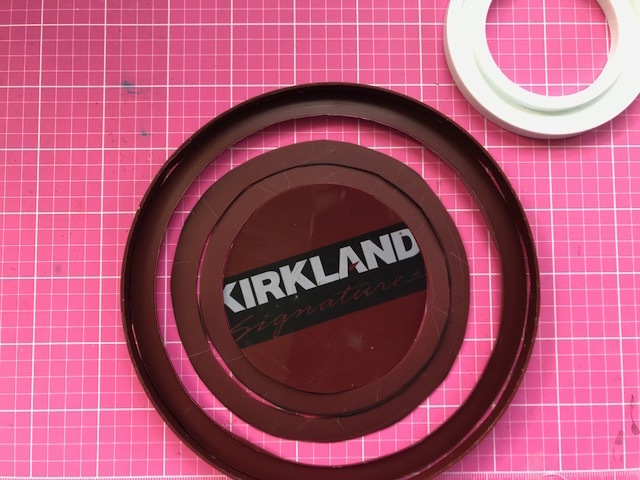 and as you can see the middle-of-the-chain insert version rolls (pink, left) and the back-bump insert version rolls (pale blue, right) but what’s this?? the middle one is flat and hands free? But how? 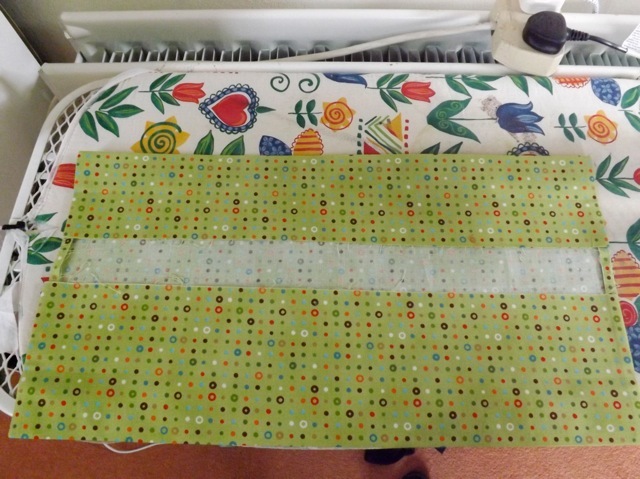 I’ll do a zoom in on the photo but although I bought new rechargeable batteries for my camera they aren’t actually charged up yet, so the zoom on the above photo isn’t as good as a macro shot of just the middle swatch would have been had my camera not died. Sorry about that. But I think you get the point. I wish the batteries had held out for a few more shots but I hope these will be enough for you. It will look very much like the back-bump front edge. 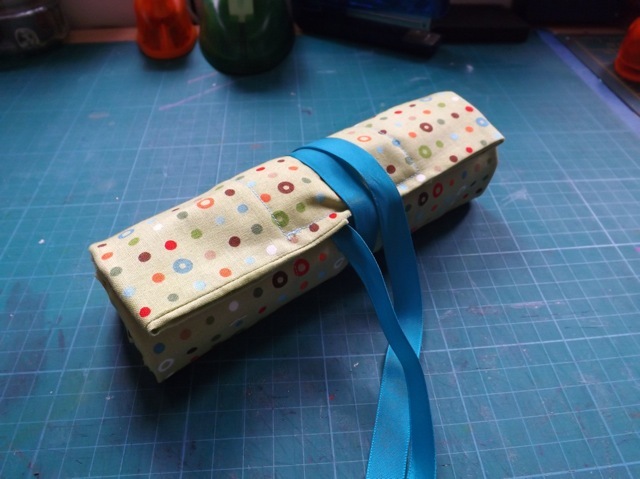 But the roll is going to be minimal – not NO roll, but very very little. 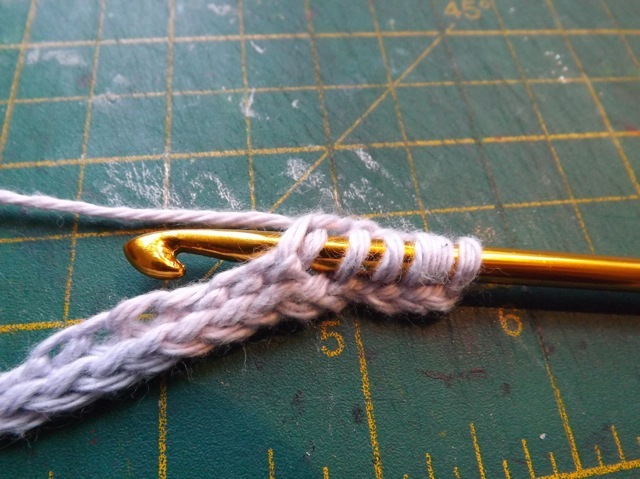 I think how loose or tight you hook will matter at least a bit, so try it and see – play around – you may not need to go to a smaller hook, or maybe a BIGGER hook will be better. What I do know is that, at least for me, doing the no-chain SC base then switching to the TSS works a treat – it’s easy to do and looks good. 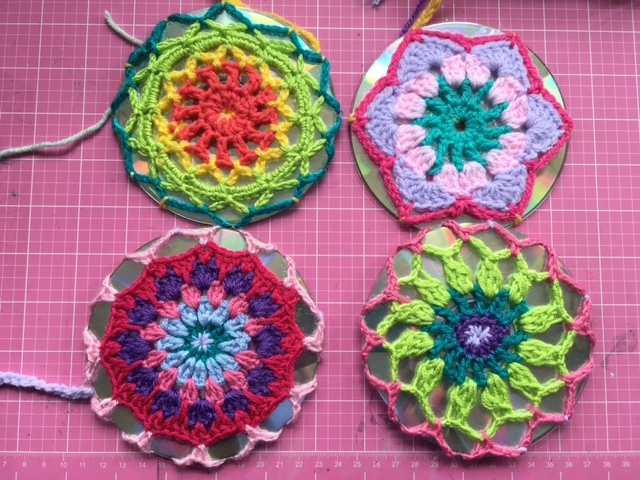 There is another technique which is very good – see it from Mikey at The Crochet Crowd. 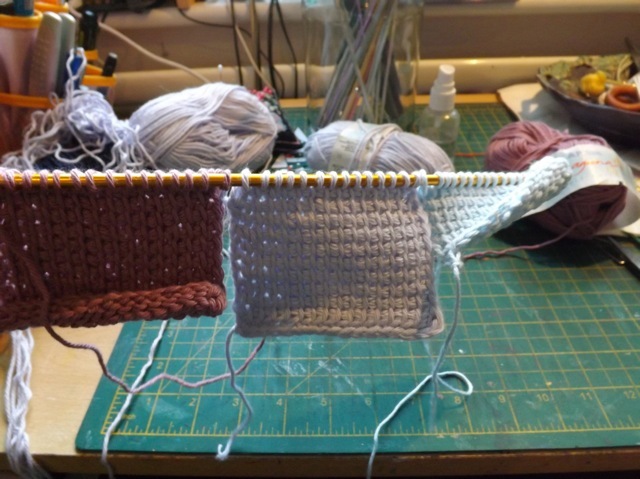 The Getting Started video shows the back-bump forward/normal reverse/TPS (PURL) forward on the second row. It does work pretty well to even out the tug of war between the rows that causes the roll but I just found it really annoying to do. Even Mikey stops the video so he can complete the row off camera. 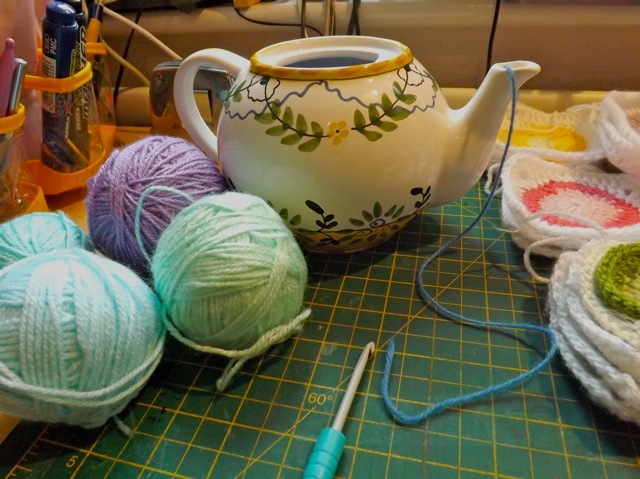 The ball rolls around inside the teapot and the yarn comes out the spout tangle free. 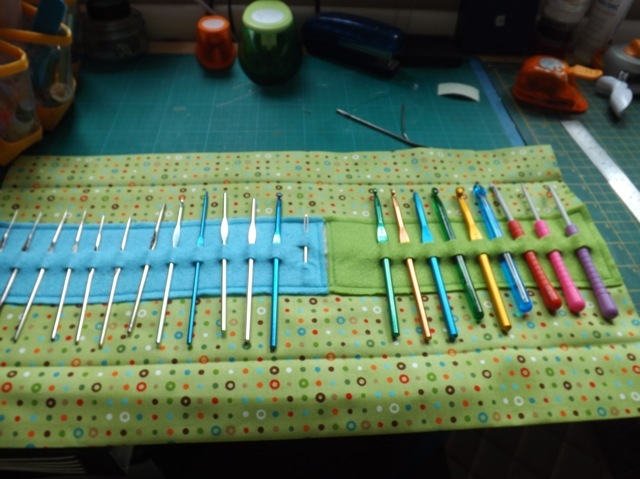 Better for the outside rounds, cause hardly worth the effort when doing one round of 12 stitches, for example, but still….I have another idea I might try to set up with a couple of other things I found kicking around. One thing about mindless cleaning, it does leave your mind free to roam…. 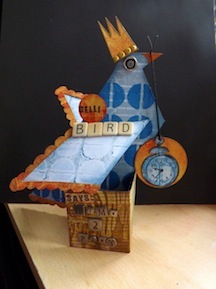 Firstly, apologies to my followers – I stupidly had a spelling error in the title of yesterdays post. I corrected it, and the slug (the thing that is made up of the title of your blog post and creates the URL link, more or less, ) but that happened seconds after the post went live. And in computer terms “seconds” might well be YEARS. The email to followers had been sent, but when you clicked the link it would have taken you nowhere. I figured if you saw the email and the synopsis was of interest, you’d have been able to get there eventually. In future I’ll first be more careful about spelling in the title or if I edit the title, I won’t edit the slug. I did at least two monumentally stupid things yesterday and this wasn’t the stupidest, I assure you. 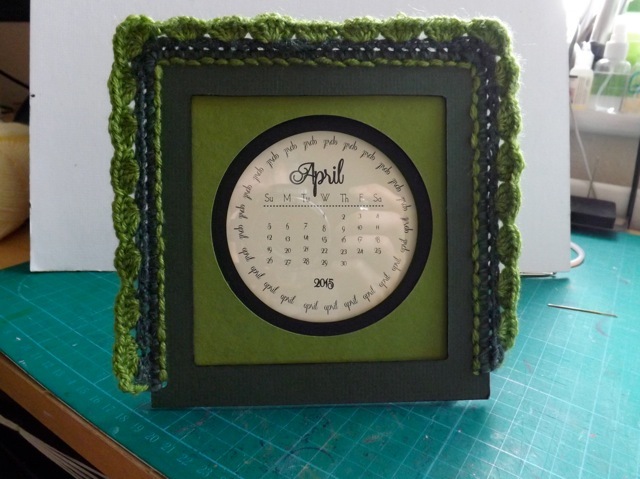 This is made from a crochet i-cord in two colours. 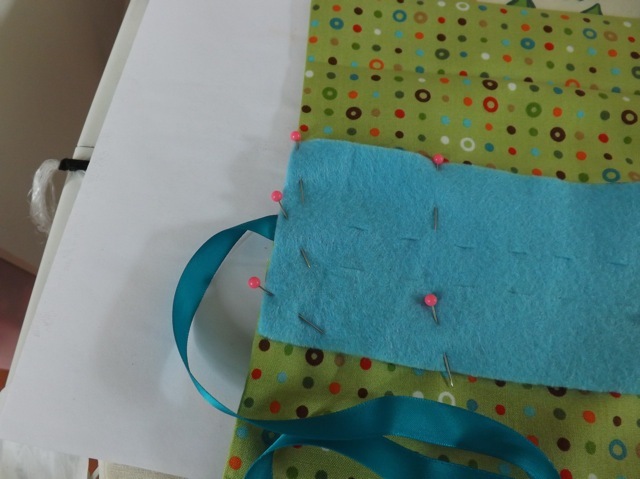 The “clasp is a button and loop. The sizing is easier with a single colour. 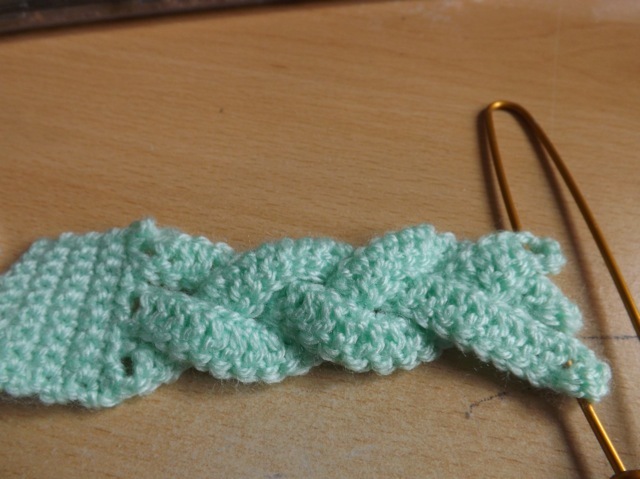 What I would suggest is you crochet the i-cord as long as you need – and this one for this knot was about 20 inches – then pull a scrap of yarn of another colour thru the three loops on the hook. 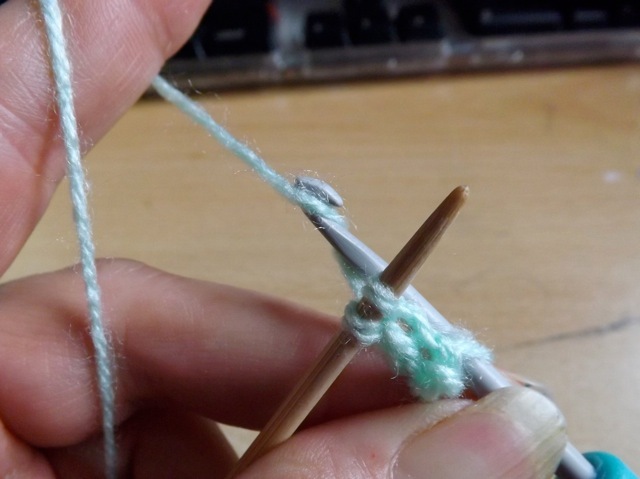 Once the knot has been made, sew the loop on the beginning end then lay it over your wrist to get the size right. 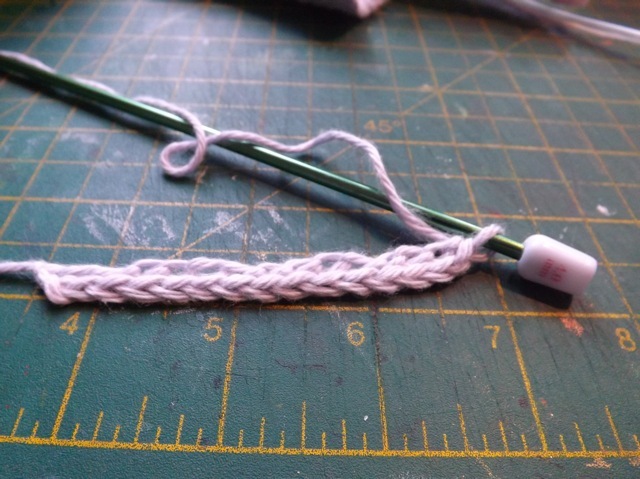 Just unravel the end of the cord then pull the tail thru and weave in the ends to finish it off and sew on the button. 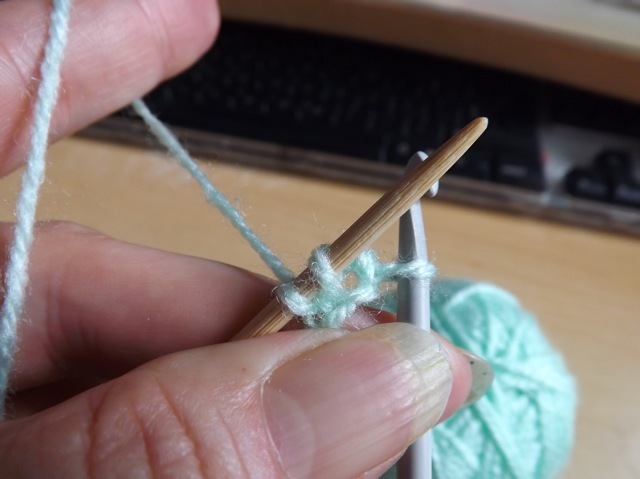 Start off with about 16 inches for a very fine wrist or maybe 18 for a larger wrist, then try the knot and see how close you are. Mine was about 20 inches and I did have to unravel an inch or so. Now the links. 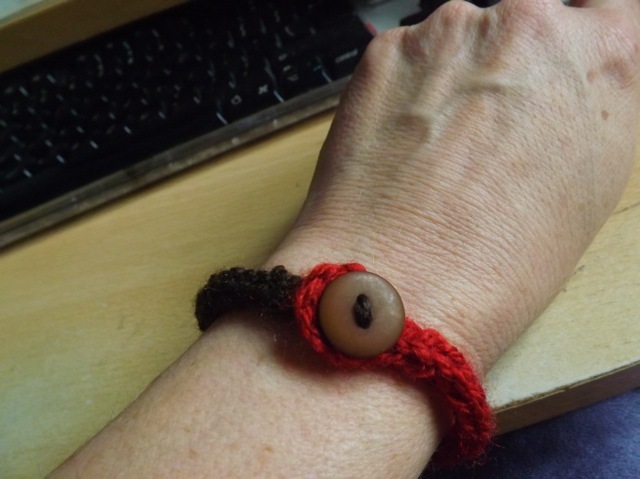 I saw this bracelet using a KNITTED i-Cord and I thought it was cute. 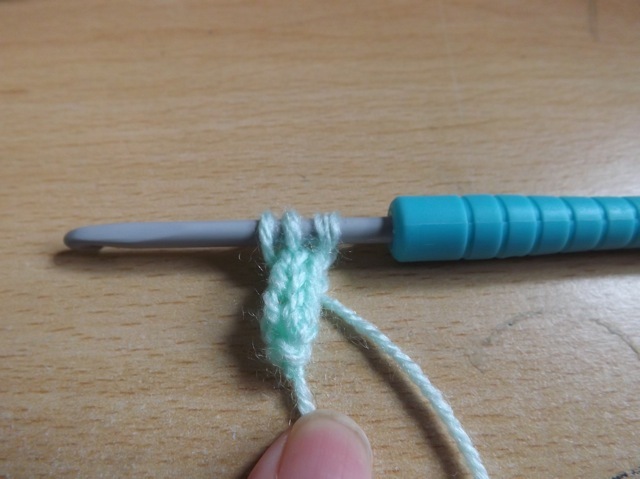 So I went looking for a crochet i-cord. And I found THIS. But OMG – I am completely incapable of the whole drop-two-loops-but-hold-on-to-them part. She is clearly more adept than I am or has younger, nimbler fingers! I kept losing one and then it would unravel and trying to pick the stitches up again was doing my head in. 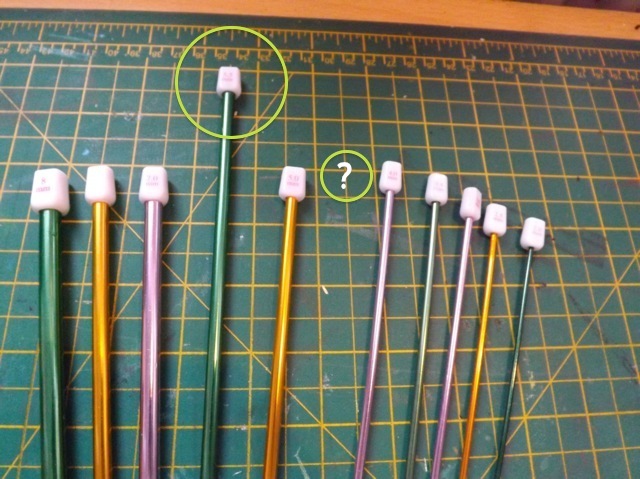 Sure, I could have found however many double-pointed needles (three or four, I forget) I would need and KNIT the i-cord but that’s not what I wanted. After fighting with it for far too long I took a step back and thought how I could keep track of those loops and my sanity. 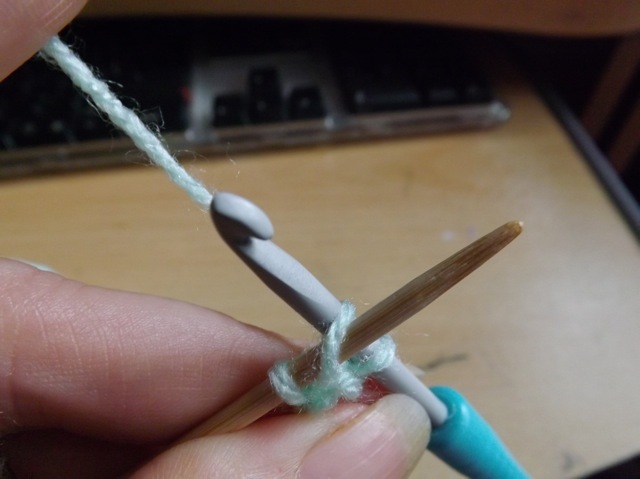 The double-pointed needle was the key. 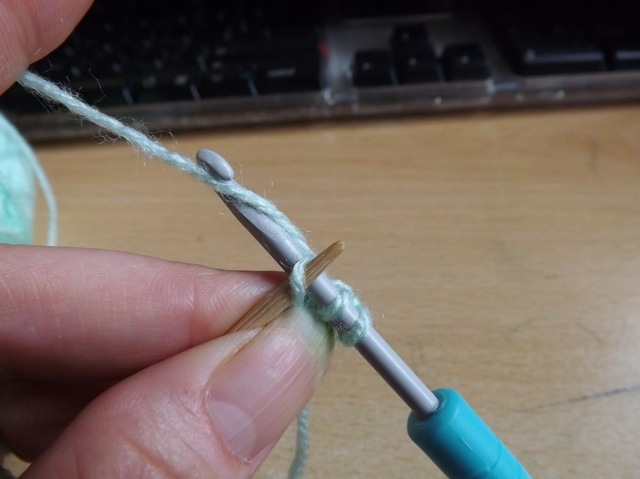 This does make a slightly looser cord, but if you can manage to use a smaller hook than the yarn actually requires and make sure you tighten up the tail when the two loops are on the needle, it’s tight enough. 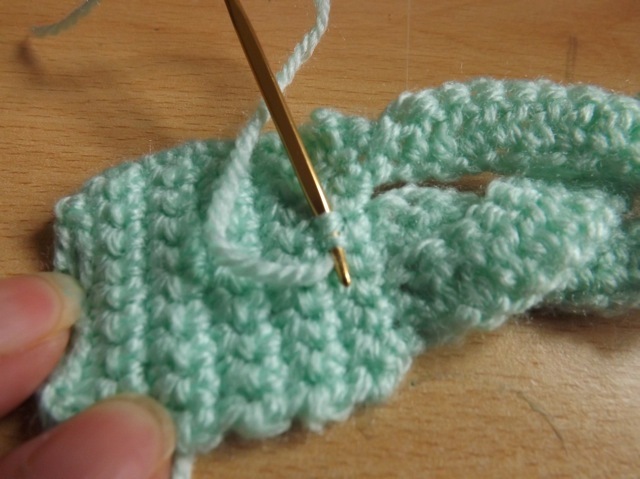 Start the crochet as she says, Chain 3 then pull up a loop in each of the first 2 chains – 3 loops on the hook. Her instructions say “drop the first two loops but hold on to them” – yeah, right. If you can manage that it’s a lot easier! 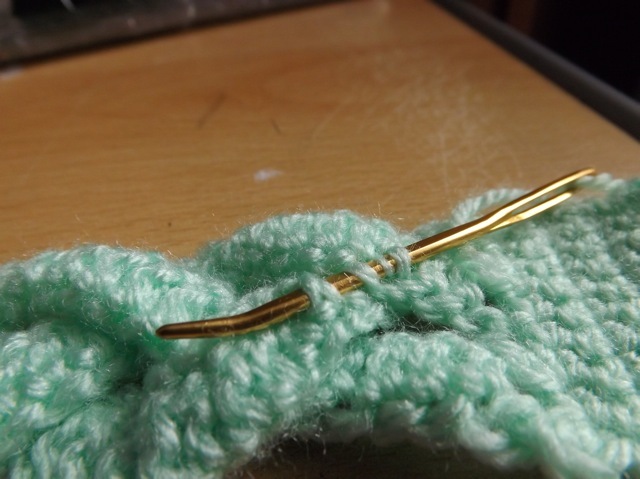 The first stitch is to chain in the loop on the hook. I did that behind the needle. 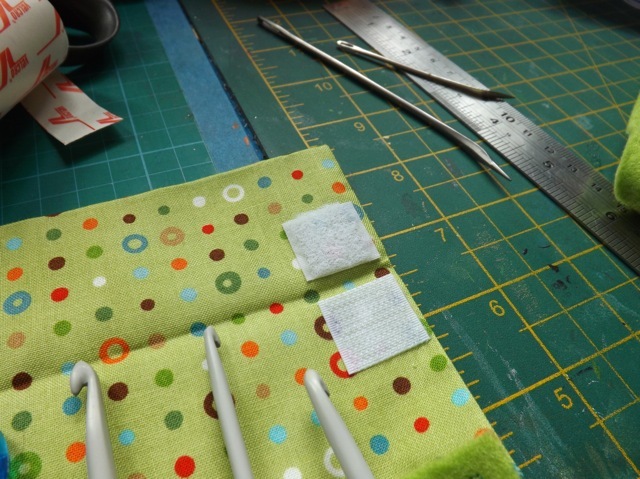 Make sure you tighten the tail so the loops on the hook are SNUG but not massively tight. The next step is to chain in each of the other two loops. 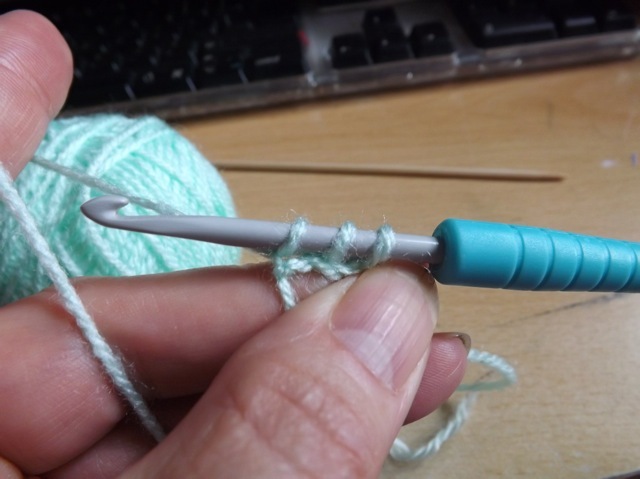 She slips them BACK onto the hook but I found it easier and faster to slip the hook into the stitch on the needle, BEHIND the needle, then work the chain and THEN slip it off. 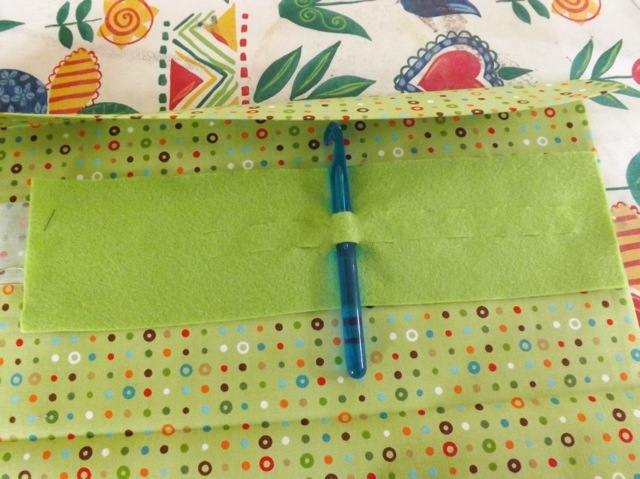 The slip off the first two loops and repeat until the i-cord is as long as you need it to be! You can see it looks just like a knitted i-cord, if ever so slightly looser. Maybe. 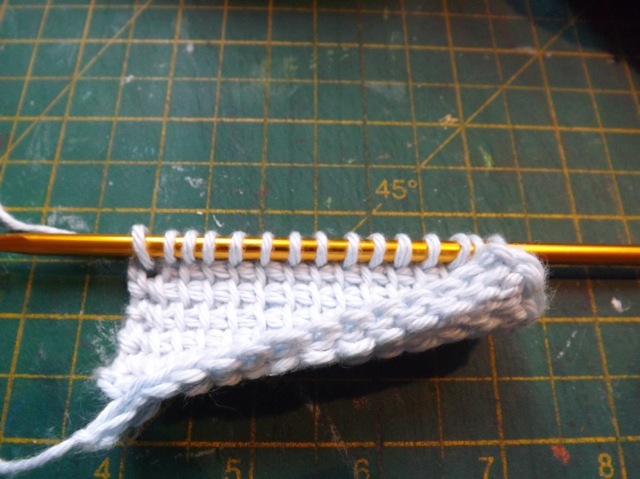 I didn’t knit one for comparison as that would have required me finding MORE double-pointed needles! 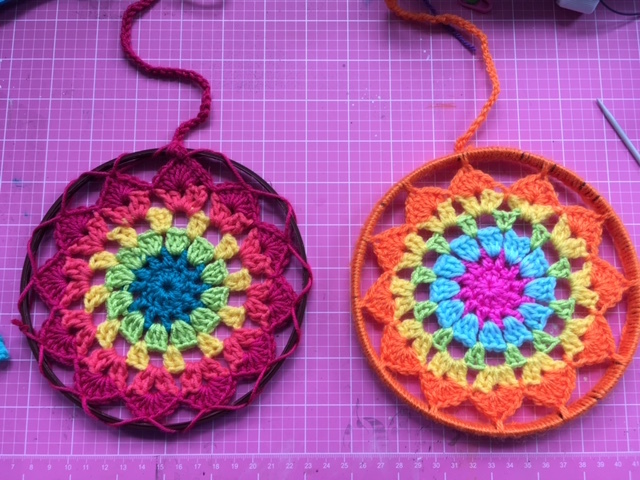 And funnily enough when I was writing this, in going back to look for the link to the crochet i-cord so I could add it, I found ANOTHER link that does almost exactly the same thing I show here! So not a new idea. She does slip the loops back on to the hook the do the chain, but otherwise it’s pretty much the same thing. Nothing new under the sun…. 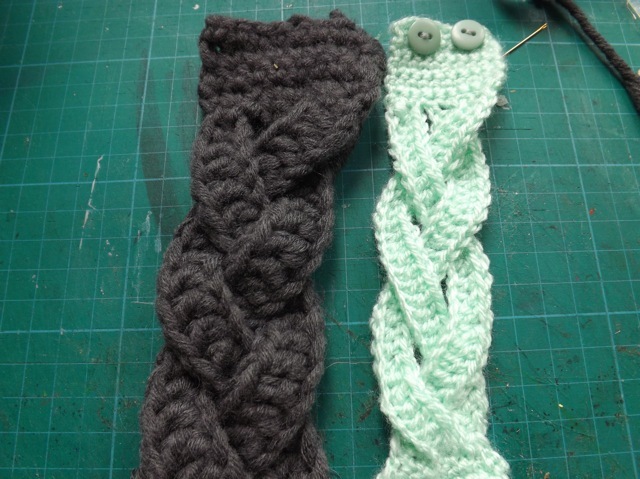 While I liked the original knot, the cord I made was pretty long so I went looking for other sorts of knots. And I found this one, which is cute and slightly more complex. And THAT is the knot I used. 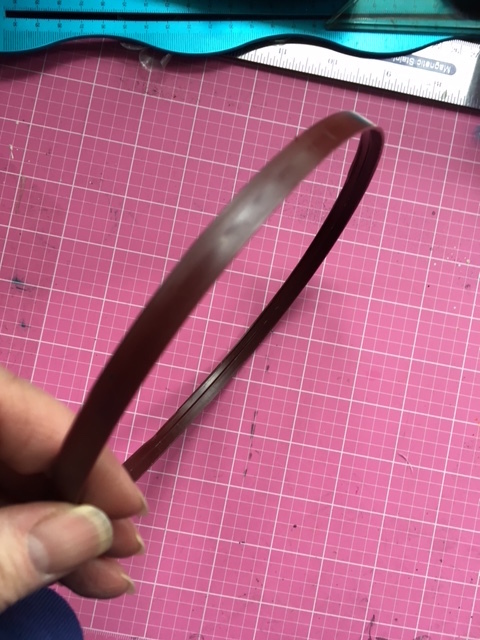 Because it is from a single cord and not two, there isn’t the double side strands like the original one I saw – it’s a thinner bracelet and doesn’t need to be tied on. Pulling it on and off that way stretches the yarn too much, I think. 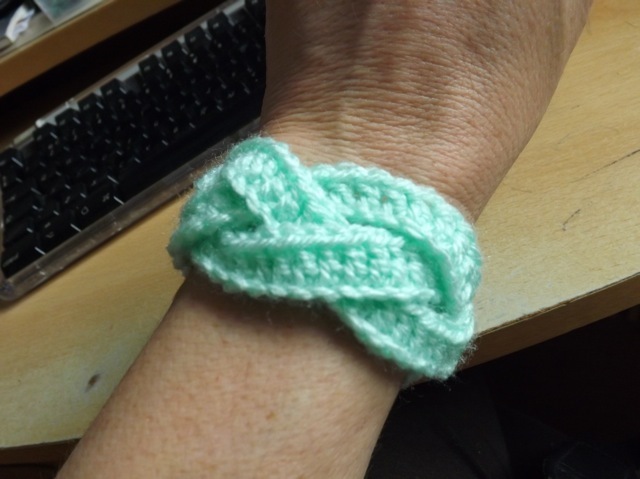 And overall this knot seems flatter on the wrist. I am dying to try it with the smooth, slightly shiny WI yarn – I think I have soft and cuddly but they also have a soft and shiny (?) version that I didn’t buy. 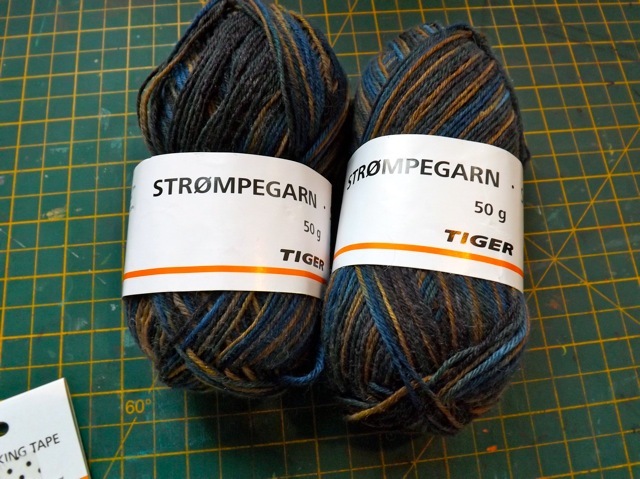 Have to check my stash and see if I have something similar, or get some, cause the less wooly, smoother yarn might make for a better (and certainly more summery) end product! How’s that for a meander across the net? 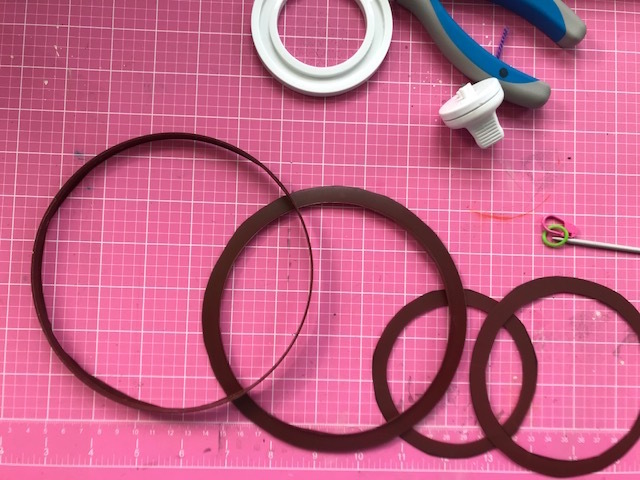 Pulling together knowledge from various crafters to create something inspired by them all, but at the same time, new. MAYBE. Who knows, if I took more time to look, that I wouldn’t find someone else out there who did EXACTLY the same thing? Really, it is BRAID not BRAIN – DOH! 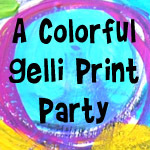 Corrected, but not sure the email link will work as a result if the slug is edited. Sorry. If you read here at all you are aware that it only takes a stray comment to set me off on a quest. 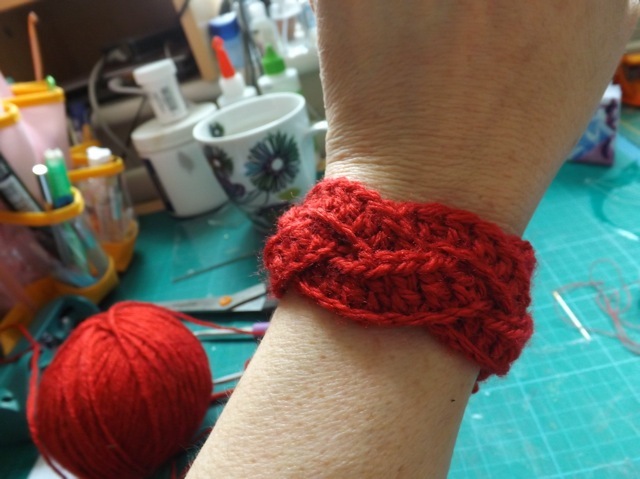 At crop a few weeks back, Julia’s mate Ally showed a photo of a knitted cable bracelet, and said she wanted one. 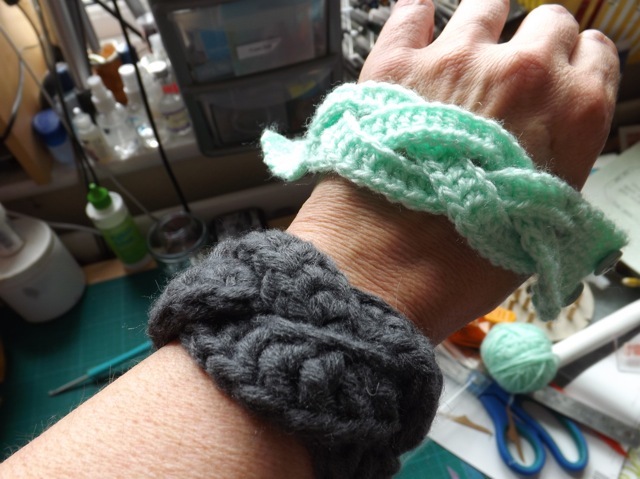 She doesn’t knit, so I said, Oh, I’m sure if you Google crochet braid bracelet you will probably find one for crochet that you could do instead. Yeah. Right. Famous last words. I DID Google it and I DID find a fair few versions, but I didn’t like them. 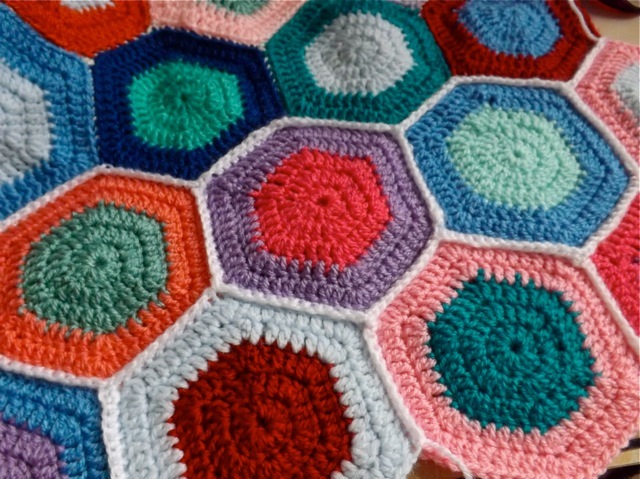 You might, but to me they all support the comment knitters make, that crochet is gross – and by that I don’t mean gross as in disgusting but gross as opposed to fine. 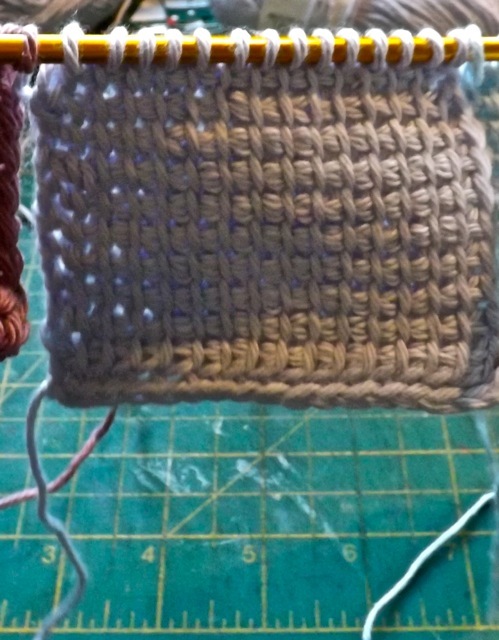 They all seem to use a combo of front post and back post triple crochets (UK double treble I think) that just don’t appeal TO ME. 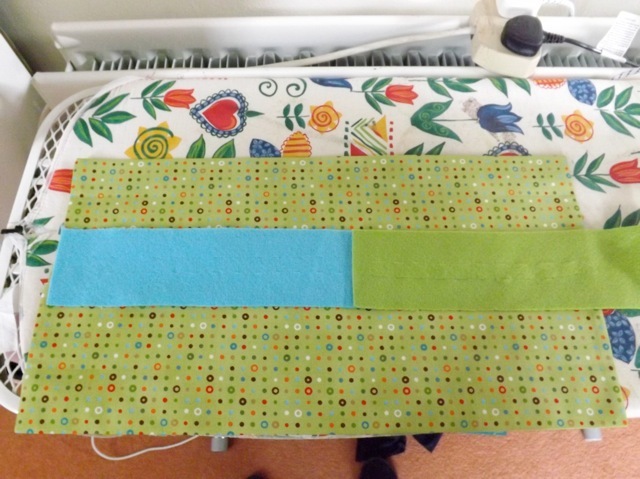 I had an idea that I thought would work but it took me a while to sort a pattern. 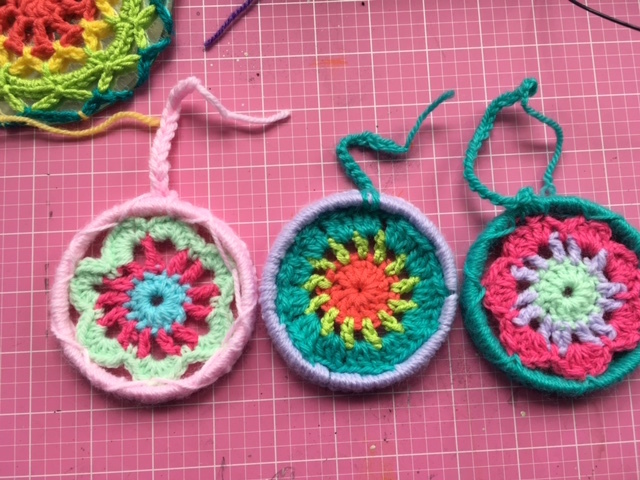 Do please remember I am not a professional crochet gal, nor am I experienced at writing patterns. 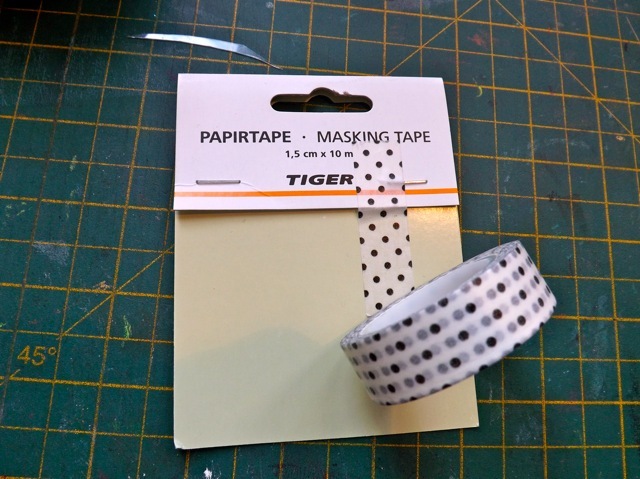 I hope I have made it clear, and the instructions suit ME but might not be exactly like a professional pattern. What I like about it is that the parts are clearly defined and maybe a bit finer than the FP/BP combos, which are pretty thick and a totally different look. 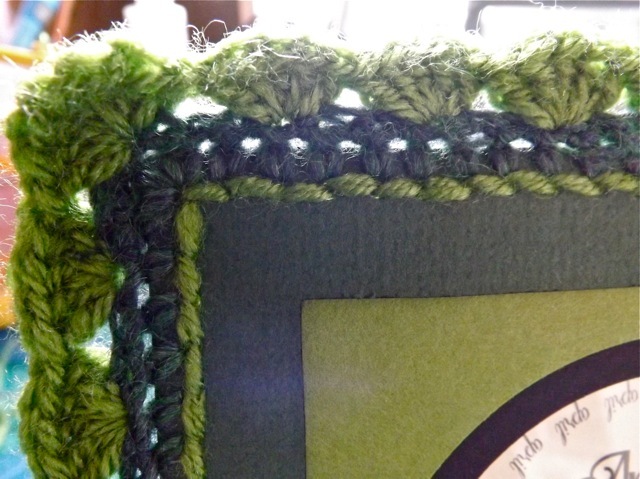 SS (Slip Stitch) and Chain are the same in both, so far as I can tell. 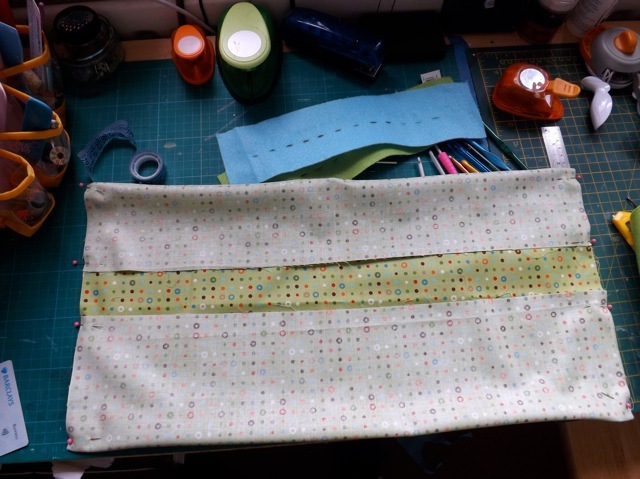 The Braid – this is composed of three “fingers” – the italic stitches are worked on the base, the chain up and DC back works the fingers. DC in the 2nd chain from the hook back down the chain. BE CAREFUL not to let the chain twist. 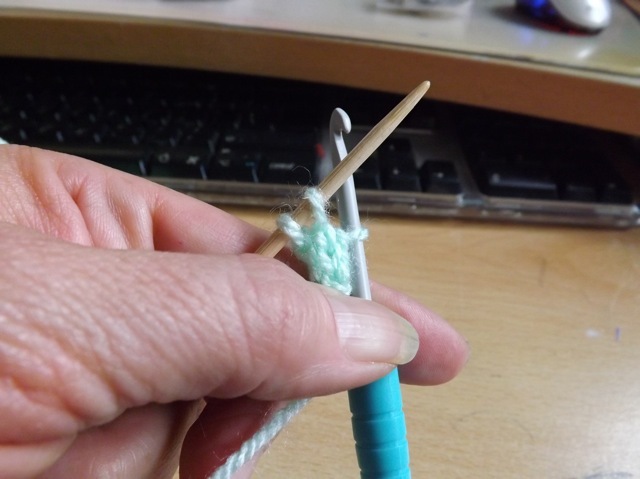 Break off the yarn with a LONG tail and pull the tail thru the loop on the hook to finish off. Braid the three fingers, just like you would plait hair! 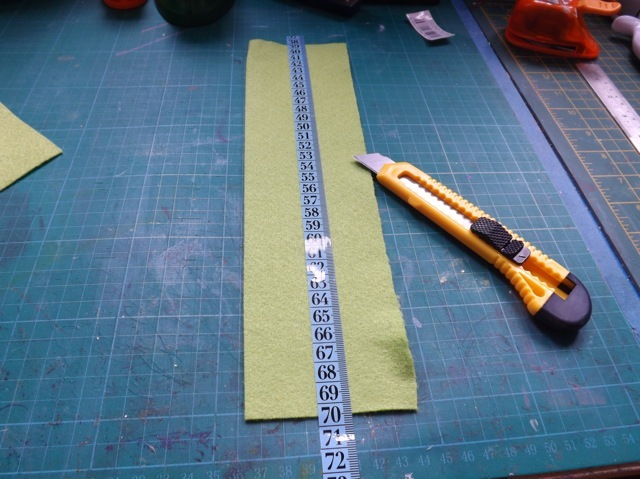 Don’t pull the plait tight, and keep the two ridges on either side of the DC flat and upwards. 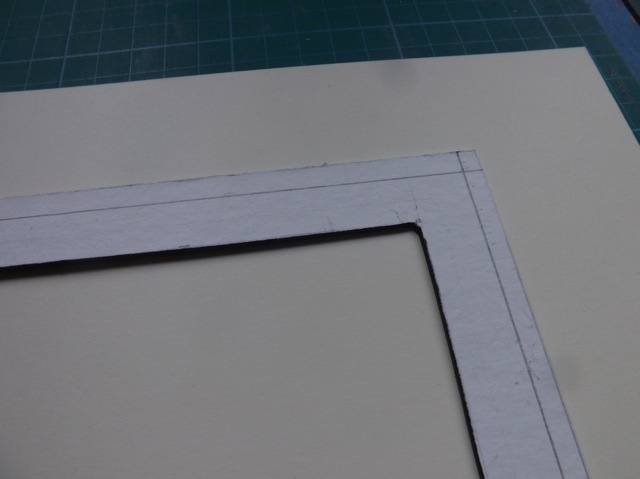 You MAY prefer to make the back of the piece the front, if you prefer the smoother look of it. 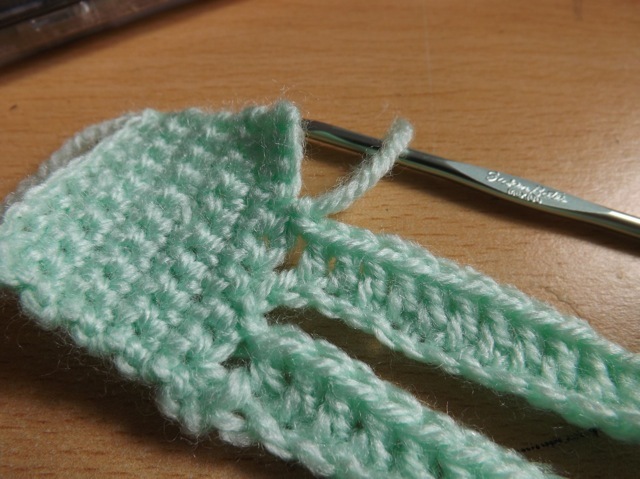 Thread the ends of the fingers onto a knitting pin to keep them from moving around. You can see that above. 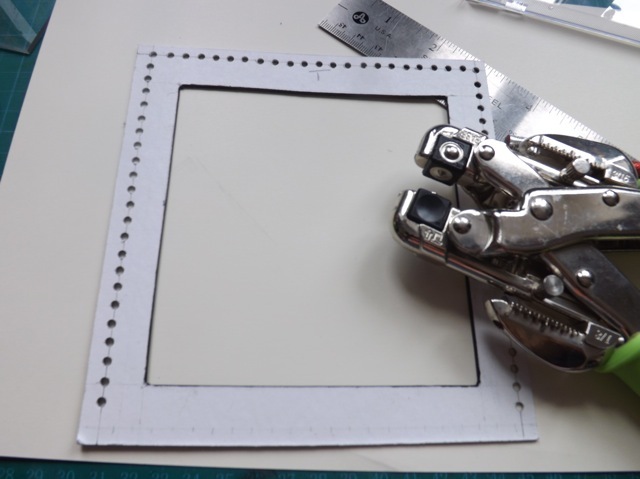 Chain 1, 2 sc in the next finger, Chain 1, 2 SC in the final finger, Chain 1 (turning chain). You should again have 9 stitches across the base and your turning chain on the hook. You can now remove the pin! Sorry, I think I missed taking a photo of this step but you can see the result in the final piece. 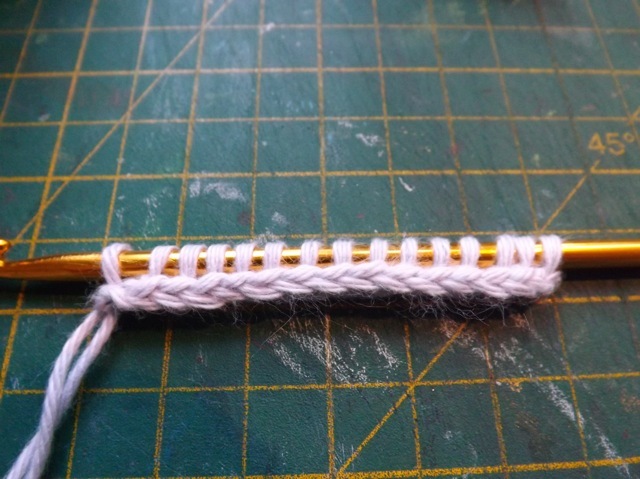 This joins the separate fingers into the plait/braid and “locks” them in place. 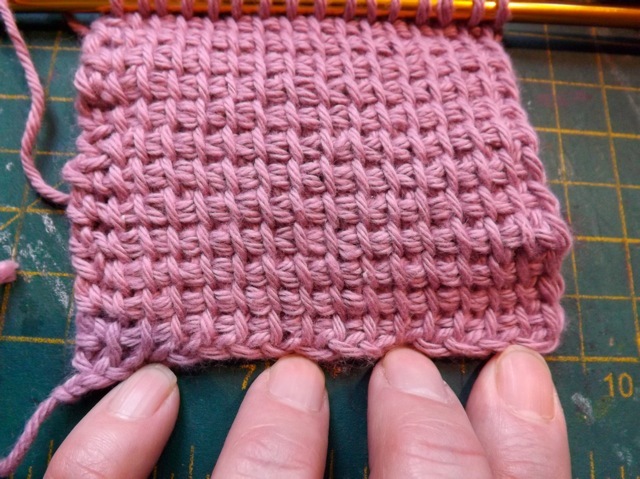 repeat this until the end block meets the initial block when wrapped around your wrist, then do two more rows. As this is going to be worn and probably washed weave in the ends (all but the long tail one) but double back on yourself a couple of times to make sure the ends are secure and won’t work loose. This is optional – if you want to make sure your braid doesn’t twist around in the wearing, weave in that long tail loosely but take it all along the back of the braid, catching the loose fingers and securing them in place. Again, double back on yourself a few times to really secure it. And I did a CHUNKY version just to see how it looked. Might be TOO chunky, not sure. Def. too chunky for a hot summer day LOL!. So there you go. It is def. DIFFERENT to the cable bracelets Ally showed me, but I think it has a charm of its own. And def. 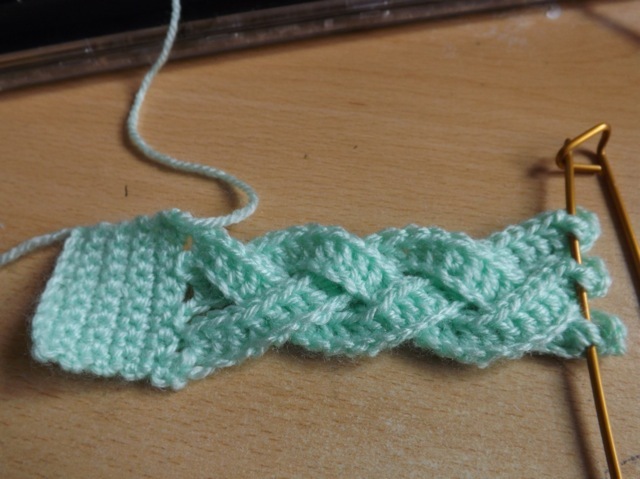 works better for crochet, even it is it a fairly bizarre construction. 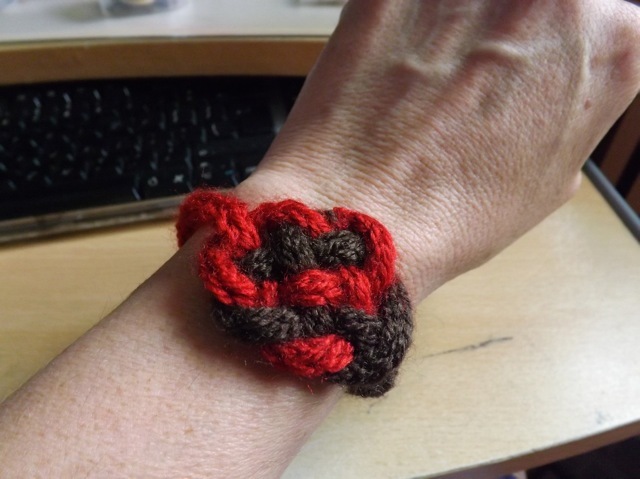 If you make one I would sure love to know if the pattern made sense to you and to see your bracelet. 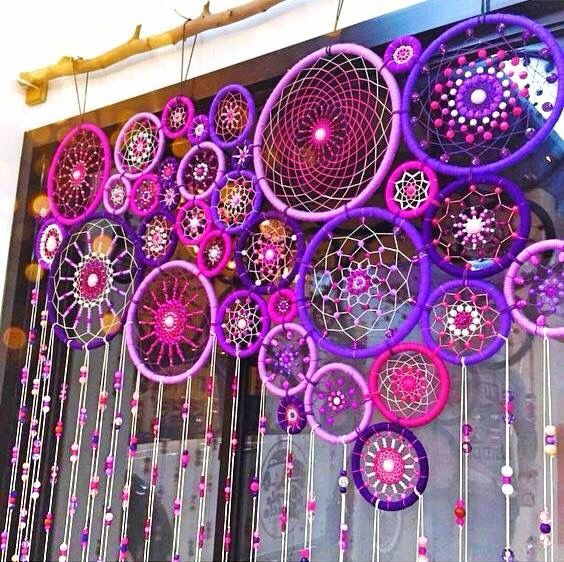 I wonder if Ally would deem it good or a disappointing crochet version of a knitted project. 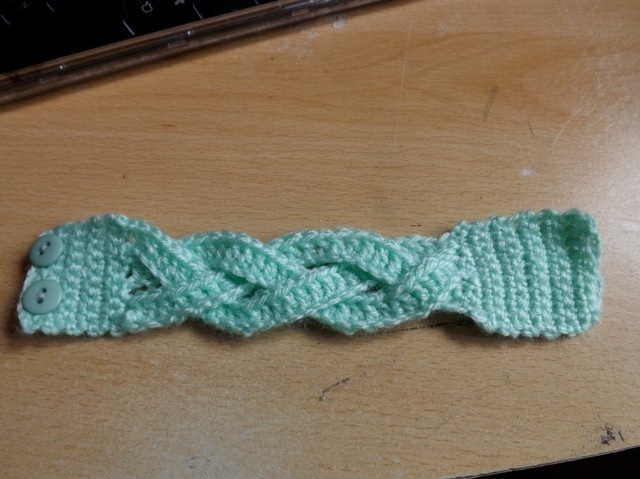 BTW I think this would make a cute headband as well, just by making the beginning and ending blocks longer and at least doubling the chains that make the fingers, then adding a chunk of elastic between the two ends. 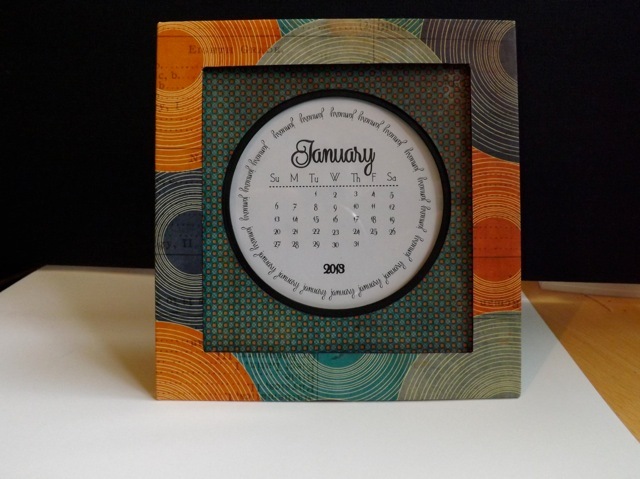 As requested, here is the round CD calendar from a few years back, updated for 2015. Two months per sheet, sized to cut and fit a CD case. 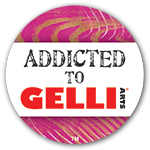 Download it here. 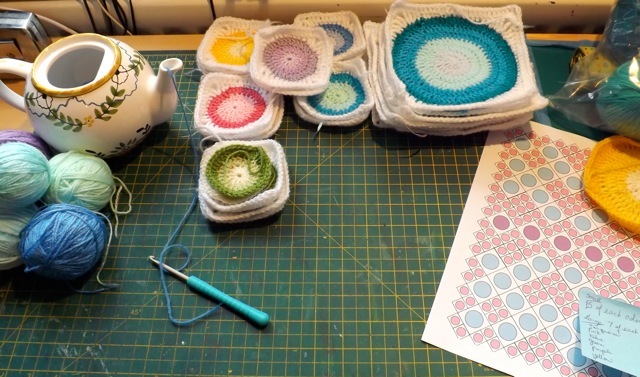 It’s not QUITE done yet – I’m considering some crocheted flowers and the date (NOT crocheted – that would be SILLY!) at the bottom. 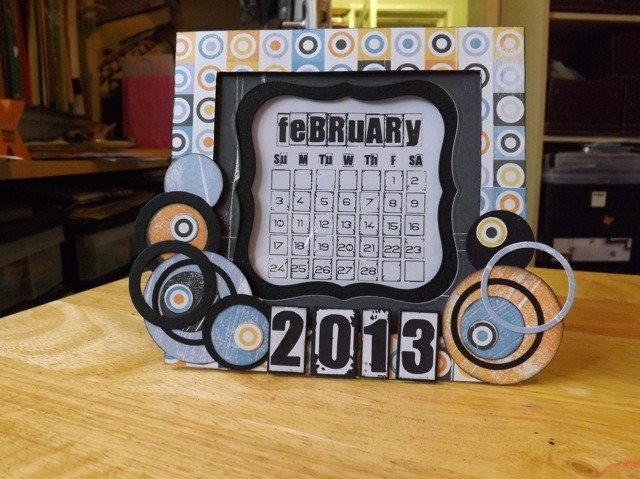 Categories: calendars, crochet, downloads, printables | Tags: calendars, Crochet, printables | Permalink.